In this issue: New LCIA rules come into effect; The importance of the link between mediation and arbitration; Challenging enforcement of an arbitral award in Australia (1); Challenging enforcement of an arbitral award in Australia (2); News; Conferences and events. The table below provides a brief guide to the changes and additions to the 2014 LCIA Rules and this article goes on to consider them by way of comparison with recent changes to practice and procedure in other international arbitration institutions and bodies. Procedure Parties are encouraged to make contact to agree procedure within 21 days after the formation of the tribunal. Seat/law If parties have omitted to identify a seat of arbitration in their agreement or do not nominate one prior to the formation of the tribunal, the seat will default to London. (Article 16.2) This does not affect existing provisions allowing for hearings and other matters to be conducted elsewhere when agreed by the parties. Some of the changes made to the ICC rules in 2011 in respect of the appointment of emergency arbitrators and consolidation of proceedings are reflected in the 2014 LCIA Rules. The ICC provisions for emergency arbitrators may be less helpful than those of the LCIA, as the arbitrator will issue only an order, rather than an interim award. This could cause difficulties with cross-border enforcement under the New York Convention. The SIAC Rules were revised in April 2013, and included a number of procedural and substantive updates. Among the most interesting was the inclusion of an express power for arbitrators to rule upon matters that have not been pleaded by the parties (Rule 24(n)). This issue arises regularly in arbitrations, when a party has failed to consider or make submissions on a relevant issue4. SIAC neatly clarifies this issue by specifically allowing the arbitrator to make a ruling on the issue, provided it is brought to the attention of the parties and they have an opportunity to respond. Arguably, an LCIA arbitrator could adopt a similar approach without falling foul of their general obligations, but the LCIA has not made a specific change in this respect. The HKIAC revised its rules in November 2013. The LCIA, like the HKIAC, has recognised that parties wish to streamline disputes where possible. Both have implemented a new procedure for emergency relief and broadened their approaches to joinder of parties and consolidation of proceedings. Given the prevalence of disputes involving chains of contracts and/or multiple parties, these changes are to be welcomed. The LCIA has added consolidation powers for situations where there is agreement between the parties and approval by the LCIA; or where multiple arbitrations have been commenced under the same (or a compatible) arbitration agreement, between the same parties, and the tribunals have not yet been formed or are formed of the same arbitrator(s). This allows for flexibility and potential cost-savings, whilst respecting privacy and party autonomy. The HKIAC provision goes further than the LCIA provision, allowing consolidations of arbitrations involving different parties, provided that there is a common legal and factual background, and also allowing the potential for consolidation (or joinder) without all parties’ consent. The HKIAC’s revisions also homed in on more general cost considerations. It already had a reputation for being at the forefront on costs by allowing a choice of fee structures. The new HKIAC rules introduced an additional fee cap on arbitrators’ hourly rates. At the time of writing, the LCIA had not yet published its new fee schedule and it will be interesting to see whether it follows suit. The new measures in Article 18 and the Annex of the 2014 LCIA Rules broadly reflect the substance of the IBA Guidelines on party representation (reviewed in the September 2013 edition of IAQ). The measures bind the parties themselves, making them expressly responsible for the conduct of their representatives. LCIA approval is now required for changes to or additional party representatives during the course of an arbitration. This is intended to avoid conflicts of interest with the tribunal that could compromise the arbitration or award. It is hoped that these new provisions will assist arbitrators in taking a more decisive, firmer approach to obstructive or underhand tactics, or even simple misunderstandings as to acceptable practice and procedure. For more information, please contact Eleanor Midwinter, Associate, on +44 (0)207 264 8013, or eleanor.midwinter@hfw.com, or your usual contact at HFW. The emergency arbitrator provisions contained in Article 9B will not take effect on 1 October 2014, but parties will be able to agree in writing to the inclusion of Article 9B if they wish to do so. Parties should bear in mind any specific terms in the underlying contract prohibiting the use of email for service, which would most likely override the LCIA rules. In case of any doubt, it would be prudent to obtain the opposite party’s specific consent to serve documents via email. Most practitioners would advise inclusion of such a declaration in expert reports in any event. The attitude towards mediation is changing in many jurisdictions. Lawyers, arbitrators, the judiciary and professional clients are adopting a more positive and sophisticated attitude towards its benefits. There remains scope for improvement however and it is hoped that some important recent developments will assist in this process. The first development is the proposed establishment of a Singapore International Mediation Centre1 (SIMC). In December 2013, the Singapore Minister of Law welcomed the recommendations made by the International Mediation Working Group to develop Singapore into an international commercial mediation centre. It is understood that the SIMC will be established in November 2014. The mediators will be approved and selected from amongst internationally renowned mediators and initially, the SIAC Registry will administer matters such as appointment, assistance with venues and collection of fees. The working paper for the SIMC anticipates an “Arb – Med – Arb” dispute resolution clause, whereby arbitration is commenced and then immediately the parties go to mediation, only reverting back if they cannot settle. In arbitration, arbitrators will be encouraged to order, or at least consider, “mediation windows” for some if not all disputes. There also will be a change in the law so that a mediation agreement can be converted into an arbitration award by consent, giving the parties the benefit of New York Convention enforcement rights. The introduction of the new Rules could be seen as a narrowing of the ICC’s ADR focus, given that the old rules also encompassed other forms of ADR, such as conciliation and neutral evaluation. However, these are still available under the new Rules, albeit that the ICC’s emphasis is now upon mediation as the default ADR tool. In fact, this emphasis only reflects what was already happening in practice: approximately 90% of ICC ADR procedures held under the old rules took the form of mediation. The new Rules constitute explicit recognition by the ICC of the predominance of mediation as an ADR method. The new Rules are not prescriptive as to how mediations should be conducted. They deliberately provide flexibility, leaving the mediator to determine procedural matters to suit the needs of the parties. The mediator is required to discuss with the parties how the mediation will be conducted and to set this out in written form. The parties are free to withdraw if they do not agree with the mediator’s proposed approach. This reinforces the parties’ control of the mediation process. The new Rules envisage a hands-on role for the ICC International Centre for ADR. Unless the parties have agreed otherwise, the Centre will select a mediator. It will also help the parties reach agreement on the conduct of the mediation, particularly with practical matters such as venue and timing. The intention is to free up the mediator to focus impartially on the core task. The new Rules are supplemented by Mediation Guidance Notes, which address commonly encountered issues such as the interplay between private and joint sessions, and the use of case summaries, as well as providing guidance on effective preparation, the need for attendance by a person with settlement authority and, more fundamentally, the differences between mediation and arbitration. Importantly, the new Rules have been drafted to work in conjunction with the existing ICC Arbitration Rules, providing for a joined-up dispute resolution system. In fact, the Mediation Guidance Notes actively encourage arbitrators to consider the use of “mediation windows”, pausing or staying proceedings to allow mediation to take place. The new Rules represent a welcome effort by the ICC to place mediation at the forefront of its ADR procedures, in line with current practice. It is encouraging to see mediation being promoted as part of a dispute resolution toolkit alongside arbitration: these methods have too often been employed on a mutually exclusive basis, missing opportunities for efficient settlement. To avoid wasting costs and time, and to encourage good faith in the parties, mediation cannot operate in a vacuum. Either court proceedings or arbitration should be in place, even if not active, so that at an appropriate time the parties can refer some or all of their disputes to mediation, knowing that if they cannot settle, they can revert immediately to the proceedings. Parties to a mediation usually want to keep both their participation and the details of their negotiations confidential – and confidentiality may make settlement more likely, giving them greater freedom to negotiate. The ICC’s approach to confidentiality under the new Rules is therefore interesting. Previously, all ADR proceedings conducted under ICC rules were confidential, including their outcome. The new Rules still provide for proceedings to be private and confidential but they explicitly exclude from the scope of this confidentiality the fact that such proceedings are taking place, have taken place or will take place. Briggs J3, as he then was, proposed that a new and special mediator privilege should be created to protect the parties and the mediator against any need to disclose ‘mediator secrets’, things told to the mediator by either party in secret which they do not want the other to know. Any rules or laws that made disclosure of all documents and statements in mediation open and available for use in subsequent arbitration or court proceedings would be problematic, in particular any admissions, or statements as to compromise or settlement, as well as “mediator secrets”. However, in my view, if evidence of a general nature comes out in a mediation, then it should be disclosable subsequently. For example, If a party’s expert says one thing at mediation and another in court, he should be open to cross examination. This would in my view make parties more transparent and honest in their approach to the mediation process. An arbitrator cannot order mediation. It would be outside their jurisdiction and contrary to the consensual nature of mediation. However, there may be scope to argue that arbitrators should have the power to impose costs penalties on a party for refusing proposals to mediate. If mediation is to continue to develop, quality and regulation of mediators is essential. It is not unsurprising that bodies like the ICC and SIMC, looking to include mediation as one option in a holistic dispute resolution regime, will wish to govern approval of mediators, and assist in the running and control of mediation. This is to be welcomed, as it can only improve the perception of mediation generally. For parties involved in mediation, the role and powers of the mediator is a key consideration. A mediator should not focus on settlement at all costs, with no interest in the feelings of the parties. It is my practice to ask the mediator to reserve a few hours the day before the hearing to meet with the individual parties and their solicitors in private. Clients who have never met the mediator find it helpful to explain their case. They are often emotional, feeling hurt or confused. It provides an outlet for this emotion, which can otherwise waste time at the hearing. The lay parties feel that they have had the mediator listen to them and this is therapeutic. In my experience, this often allows the mediation to proceed in a more measured and peaceful manner. It also allows the mediator, who will have seen the position papers by then, to get a feel for the parties and their advisors, establishing whether the lawyers are driving matters in an adversarial way or trying to step back and let the mediation take its course. Parties have the option to invite the mediator to make a binding or non-binding determination at the end of a mediation if the dispute does not settle. This can have the advantage of making the mediator more focused and conscientious during the mediation, and although some doubt the benefit of non-binding determination, experience shows that mediation tends to have an osmotic effect on the parties. Even if they do not accept the determination immediately, they may do so later – or it may affect their reasoning and will in reaching a settlement subsequently. They stop to consider the cost of continuing their dispute. They have had the opportunity to listen directly to the other side, without having it distilled through lawyers and experts. This can lead them to adopt a more balanced approach. In my view, the individual appointed as mediator cannot act as arbitrator in the event that mediation does not produce a settlement. However, before close of submissions or any major interlocutory event, an appointed arbitrator could agree to accept appointment as a mediator at the parties’ request. However, they would have to resign their appointment as arbitrator if the mediation was unsuccessful. Greater engagement, greater intelligence and greater ‘buy in’ from the arbitration community generally is required to establish mediation as a key element of dispute resolution, but the future looks bright for mediation. For more information, please contact Paul Aston, Partner, on +65 6411 5338, or paul.aston@hfw.com, or your usual contact at HFW. On 5th March 2014, the Minister of Law Mr. K Shanmugan announced that the Ministry of Law is currently working with various stakeholders, such as the Singapore Academy of Law, the SIAC and the Singapore Business Federation, to establish the SIMC. The SIMC is expected to be launched later this year. The new Rules are the successor to the ICC Amicable Dispute Resolution Rules, which had been in force since 1 July 2001. New Law Journal for 2009. PFG II v OMFS Company 1 [EWCA] Civ 1288. In a recent decision, the Federal Court of Australia1 considered whether an arbitration award was in conflict with or contrary to Australian public policy and whether or not that award breached rules of natural justice. It offers both an interesting examination of the grounds for such a challenge and an insight into the difficulties of establishing those grounds so as to make a challenge successfully. Emerald Grain contracted to sell to Agrocorp Australian, canola in bulk for delivery to Bangladesh. Agrocorp brought claims in arbitration against Emerald for demurrage, deadfreight and loss of profits, as a result of short shipment of the cargo. The Tribunal found substantially in Agrocorp’s favour. Emerald sought to set aside the award. They relied upon Article 34(2)(b)(ii) of the UNCITRAL Model Law on International Commercial Arbitration, which provides that an arbitral award may be set aside by a court if the court finds that the award is “in conflict with the public policy” of, relevantly, Australia. Under Section 19 of the International Arbitration Act 1974 (Cth), an award is in conflict with or contrary to the public policy of Australia within the meaning of Article 34 if, amongst other matters, a breach of the rules of natural justice has occurred in connection with the making of the award. Emerald contended that the award was in breach of the rules of natural justice, because there was no evidence of probative value before the Tribunal to permit it to make certain findings (the “no evidence” claims) and also because the Tribunal made those findings based on its own opinions and ideas, without having given Emerald adequate notice (the “no hearing” claims). The Court had to draw a distinction between on the one hand, an attempt by a dissatisfied party to challenge a tribunal’s findings of fact dressed up as a challenge on the grounds of a breach of the rules of natural justice with, on the other, an application to determine whether in finding the facts (correctly or incorrectly), the Tribunal did so in breach of the rules of natural justice. The basis for that challenge. or the facts or the losing party’s submissions were not accepted as the losing party had wished. In short, in order to succeed, Emerald’s challenge had to be firmly based upon the “no evidence” and “no hearing” rules. However, a breach of the “no evidence” rule was not established by showing errors in the facts found by the tribunal4. Consequently, the task for the Court was to determine whether the facts found had any foundation on either the evidence before the Tribunal or permissible inferences from that evidence. Rather than determining that the facts were found correctly, the Court had to ensure that it was open to the Tribunal to find the facts upon the material that was before them. That the finding was capable of being made by the Tribunal on the evidence before it. The Court had regard to the principles set out in Trustees of Rotoaira Forest Trust v Attorney Genera5, in particular, that it is “the overriding task of a party to show that a reasonable litigant in his shoes would not have foreseen the possibility of reasoning of the type revealed in the award and that with adequate notice it might have been possible to persuade the arbitrator to a different result”. The Court therefore had to decide whether Emerald could show that as a reasonable litigant, it would not have foreseen the possibility of the Tribunal’s reasoning and that with adequate notice, it might have been able to persuade the Tribunal otherwise. The Court found that Emerald’s evidence fell short and the challenge on the “no hearing” ground therefore failed. Emerald’s application to set aside the award was refused on both grounds. The decision serves as a reminder that in order successfully to challenge an award for breach of natural justice, an applicant must take care to ensure that the grounds on which it relies are truly met. For more information, please contact Chris Lockwood, Partner, on +61 (0)3 8601 4508, or chris.lockwood@hfw.com, or your usual contact at HFW. Emerald Grain Australia Pty Ltd v Agrocorp International Pte Ltd  FCA 414. SAS Trustee Corporation v Pearce  NSWCA 302 Giles JA at 33. Haider v JP Morgan Holdings Aust Ltd  NSWCA 158 Basten JA at 20. Australian Broadcasting Tribunal v Bond (91990) 170 CLR 321 Mason CJ at 355. 2 NZLR 452 at 463 referred to and agreed with by Murphy J in Castel Electronics Pty Ltd v TCL Air Conditioner (Zhongshan) Co Ltd (No 2)  FCA 1214 at 163. The recent case of Armada (Singapore) Pte Ltd (under judicial management) v Gujarat NRE Coke Limited (17 June 2014) has provided another example of the Australian courts’ approach to a challenge to the enforcement of an arbitral award. The Federal Court of Australia decision upheld the principal of finality and certainty in arbitration awards, by enforcing a foreign arbitral award under the International Arbitration Act 1974 (Cth) (IAA). The decision should give comfort to international commerce that Australia is now an arbitration friendly place. In October 2007, the applicant (Armada) and the respondent (Gujarat) entered into a contract under which Gujarat agreed to ship and Armada agreed to provide tonnage for the transportation of six cargoes of coking coal annually for each year from 2008 to 2012. In June 2009, Armada was placed under judicial management by the High Court of Singapore1, after which Gujarat ceased to perform its obligations under the contract. Armada commenced arbitration in London pursuant to an arbitration clause in the contract. The arbitration clause provided that any dispute should be referred to three “commercial men”, one each appointed by Armada and Gujarat and the third to be appointed “by the two so chosen”. The arbitrators made three partial final awards during 2011. Under the first award, they declared that they had substantive jurisdiction to determine the dispute. Under the second, they found that Gujarat had breached the contract and was liable in damages to Armada. They also declared that Armada would be entitled to damages in respect of any future shipments which Gujarat failed to perform. In the third award, the arbitrators determined the damages to which Armada was entitled. HFW London Partner, Brian Perrott, acted for Armada in that arbitration. Whether Armada had satisfied the requirements for enforcement of a foreign award under ss 8(3) and 9 of the IAA. Whether Gujarat had made out any of the grounds under ss 8(5) or 8(7) of the IAA for the Court to refuse to enforce the awards. The awards were not made by a tribunal which was operating under the arbitration agreement before the Court. The composition of the arbitral tribunal was not in accordance with the parties’ agreement. The Court held that the arbitrators were “commercial men” for the purposes of the arbitration clause. Each had considerable experience in arbitrating commercial disputes and both were members of a reputable professional association which regularly appointed arbitrators to determine disputes. The fact that they were lawyers did not disqualify them from being “commercial men”. Further, the parties had agreed to the appointments: Gujarat had waived its right to insist on the appointment of “commercial men” and had either waived its right to object to Armada’s appointment, or was estopped from challenging it. The second award had not become binding in relation to Gujarat’s future breaches, because the arbitrators’ declaration purported to bind the parties in the future in relation to contractual damages at a time when the relevant damages had not been suffered. Enforcement of the second award in respect of Gujarat’s future breaches would be contrary to the public policy of Australia. The Court noted that, since commencement of the proceedings, at least one further award dealing with additional damages had been made. In those circumstances, it was appropriate to give Armada liberty to apply to amend its Originating Application to seek enforcement of any additional awards. Notably, the Court found that enforcing the arbitrators’ declaration would not be contrary to the public policy of Australia. This was consistent with other decisions2 in which the Court had held that the whole rationale of the IAA, and thus the public policy of Australia, is to enforce foreign awards wherever possible, in order to uphold contractual arrangements entered into in the course of international trade, and to support certainty and finality in international dispute resolution. This decision should be seen as part of the changing landscape in Australian arbitration. It is one of a number of recent decisions where Australian courts have been asked to enforce foreign arbitration awards under the New York Convention and have done so. These include Coeclerici Asia v Gujarat NRE Coke3 (a 2013 decision in the Federal Court’s New South Wales Registry in which HFW acted for the applicant) and, more recently, International Relief and Development v Ladu4 (an August 2014 decision in the Federal Court’s Victorian Registry). Australia’s obligation to enforce foreign arbitration awards is given effect by clause 8(3) of the IAA. One of the key objects of the IAA is to facilitate the recognition and enforcement of arbitral awards made in relation to international trade and commerce5. This case, and in particular the Court’s decision to grant leave to Armada to amend its Originating Application to add awards of damages which only became effective after the initial application to the Court was made, reflects this objective. For more information, please contact Nick Longley, Partner, on +852 3983 7680, or nick.longley@hfw.com, or Gerard Moore, Associate, on +61 (0)3 8601 4511, or gerard.moore@hfw.com, or your usual contact at HFW. A company under judicial management continues in business. The idea behind judicial management is that the Court will assist corporate and debt restructuring with a view to the relevant corporation continuing in existence. 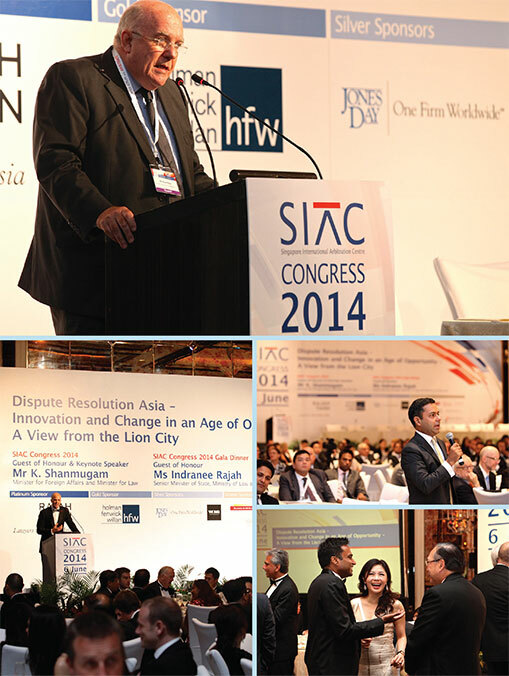 In June 2014, the Singapore International Arbitration Centre held its annual Congress. Prestigious speakers and panellists included Singapore Minister of Law, K. Shanmugam (who gave the keynote address), arbitrator, mediator and former English Lord Justice of Appeal Lord Rix and leading US mediator and arbitrator Lester Schiefelbein. As one of the biggest users of SIAC, HFW acted as a key sponsor of this event and HFW Partner Paul Aston gave an address, reflecting on the link between mediation and arbitration. An article based on Paul’s address is featured earlier in this Bulletin. Some photos from the event can be seen here.